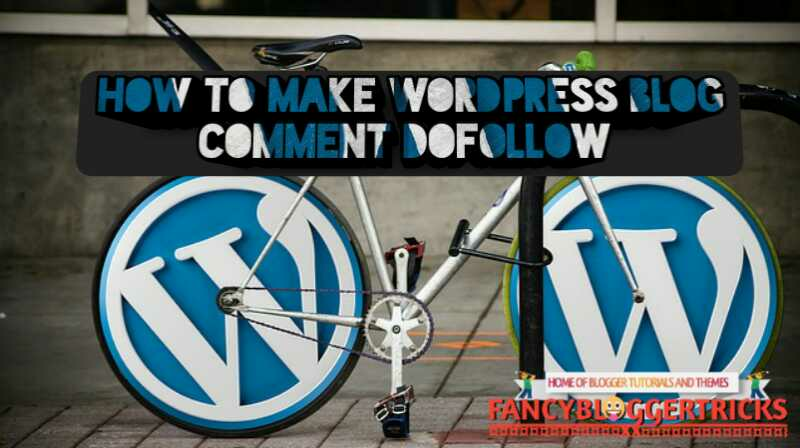 In my previous post, I talked about how to make a blogger comment dofollow but I got some comments asking if this can be done on WordPress, so today I will be sharing how to make WordPress blog comment dofollow. Like I said in my previous post, comment box are configured by theme designers to carry a nofollow attribute (rel='nofollow') . Which means search engine bots will not follow the link like it does when you have a dofollow backlink and the link won't pass Google Page rank or share your link-juice. It makes sense to keep a nofollow blog right? But it depends. So before diving into how to make wordpress blog comment dofollow, Let's get to know the benefits of keeping a dofollow comment blog. A WordPress blog with a dofollow comment box will get huge traffic immediately it gets noticed for possessing a dofollow comment box. Visitors will keep coming back everyday for a chance of getting a free backlink. Every blogger love making blog comments on dofollow blogs, therefore increasing your comments, because it's No comment! No free backlink! Your readers are forced to read your article to have some insight on what it's about and response to give. 3. Many Dofollow and nofollow backlinks. Your blog will easily get listed on hundreds of top website for dofollow enabled websites which get you more referer traffic and dofollow backlink as well. On making blog comment dofollow on blogger we have to edit html codes, but making WordPress blog dofollow doesn't require any code editing or code knowledge. This task can be easily done by using a WordPress plugin called Dofollow Plugin. Below is a detailed guide on how to enable dofollow comments on WordPress blog. 2. Navigate to Plugins, search for dofollow plugin and install it. 3. Now activate the dofollow plugin and that's it. You have successfully make your WP blog comment dofollow. You can deactivate this plugin anytime to make your blog comments nofollow again.